Step 1 Combine oil and zest in small jar with lid. Step 2 Cut stems off parsley. Stack leaves in pile and chop into small pieces. Add to olive oil. Add garlic and 1/2 teaspoon salt to oil mixture, put on lid and shake vigorously. Taste and, if it seems flat, add 1/2 teaspoon more salt. Shake and taste again. Makes about 3/4 cup. In Recipes-list.com we have selected the most viewed recipes from category - Breakfasts Main courses Vegetarian . Enjoy the best recipes specially selected for you! 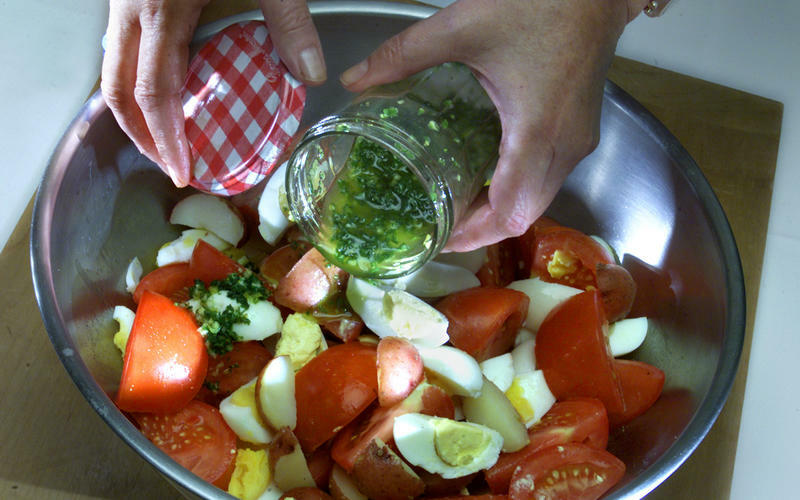 Eggs, Tomatoes and Potatoes with Gremolata is the right choice that will satisfy all your claims.